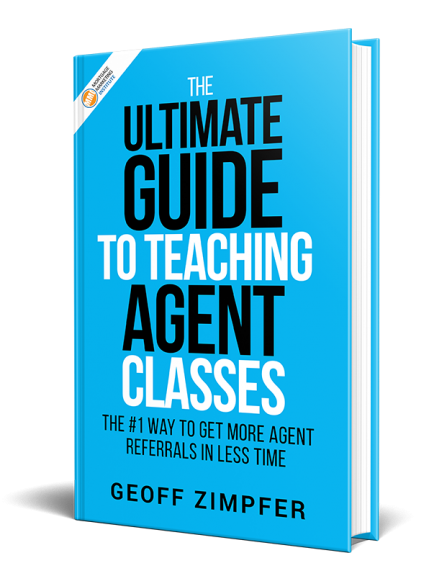 Hey listeners, Geoff Zimpfer, welcome to another episode of Mortgage Marketing Radio. So glad you are here and we are doing another quick session on CRM. What is CRM you ask? Customer Relationship Management. There’s three key areas that if you’re gonna be a highly effective and productive loan officer, you gotta master these three areas. We’ve got to be good at not only task management and getting stuff done. We’ve got to be great at communication and tracking our communication so that we’re informed, so that we’re making sure the conversation is moving forward in a very intentional way. Task management, communication tracking and then the other key piece to … a pillar of your business is marketing and marketing both for consumer based marketing, past client database marketing, staying in top of mind, staying in touch, being aware, being ready and able to know where people are in their journey of you managing their mortgage. God forbid, how many stories can we tell about loan officers missing out on a refi or a new purchase opportunities just because they didn’t talk to the past client database. CRM can help you take care of that. CRM can help you more effectively capture, nurture and convert and build trust with your leads. CRM can help you co-market with your referral partners to add value, to not just be a vendor but to be a true partner and to provide solutions and services for them to help your realtor partners be able to effectively capture, incubate and convert more of their leads. The list goes on and on and on about how many different things a CRM does for you to make you really that much more productive and efficient. 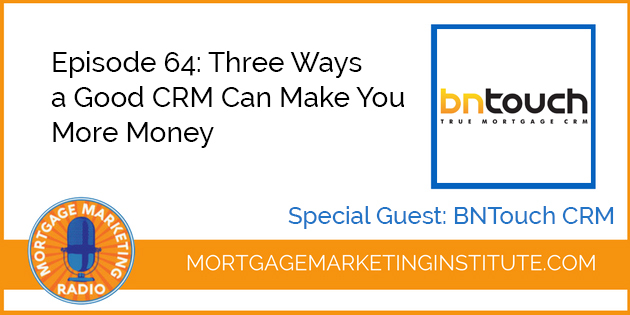 My special guests today are Chase Diamond and Eric Gemme from BNTouch Mortgage CRM. Its built from the ground up for mortgage specifically and only, so it’s not a snap on and add on, it’s not an after thought, it is built and designed as a mortgage business growth platform for you, whether you’re an individual loan officer, you’re a growing team or you’re a company, an enterprise, listening to this. BnTouch CRM is the most feature rich mortgage CRM designed to help serious mortgage professionals conquer the market. Take a listen to today’s episode and I know you’ll be glad you did. Lastly, those of you who are requesting the free t-shirts, we’ve got the new fresh stock in, thank you very much. 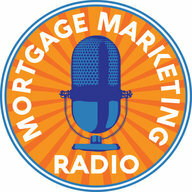 If you’re leaving a review on iTunes on the podcast let me know, get yourself a free Mortgage Marketing Radio t-shirt. Just email me [email protected] Put the subject line T-Shirt, include your name and address and shirt size, large or XL. Let me know that you did indeed leave the review and we’ll get you out a t-shirt now that we’ve got some brand new shirts in stock. >> What Should You Look for in a CRM?